A manifesto that argues for the importance of consumption in driving the economy, forming identity, creating meaning—and saving the world. In the aftermath of the financial meltdown of 2009, readers will have heard very different explanations for why the housing bubble burst, how the recession came to pass, and how we might recover from the Great Recession. But one message they will have heard repeatedly is that they should save, rather than spend. Meanwhile, of course, they have been told that the economy cannot recover without more consumer spending. We know that mass consumption is good for the economy and yet also fear that consumer culture is bad for the soul. 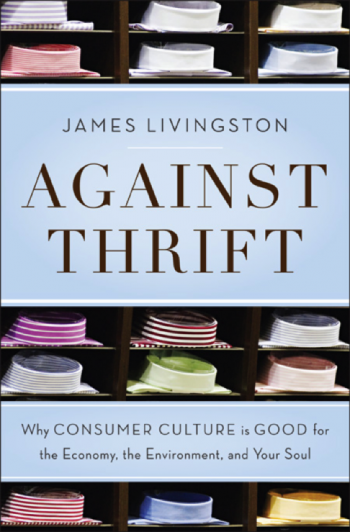 In Against Thrift historian James Livingston sets out to raise the question of whether there a way to see, and say, that the morality of spending is no less complicated and productive—and redemptive—than the morality of saving? By rethinking the sources and the results of economic growth—and by coming to appreciate that the morality of buying things is as meaningful as the morality of making things, a confounding contradiction can be resolved. The stunning conclusion of this provocative book is that spending is at least as productive, in every sense, as saving for a rainy day. Karl Marx wants you to go shopping. To save capitalism. With this mind-bendingly provocative book, Jim Livingston is out to convince you that almost everything mainstream economists say about the Great Recession is wrong. He might just succeed.